You are here: Home / Get a Better Home and Save $1,000 with Homecraft, Inc.
Summer is the perfect time to make improvements and repairs to your home, especially exterior renovations like siding and roofing. Homecraft, Inc. is sweetening the deal with an incredible combination of savings and financing to make a weathertight new roof or beautiful siding more affordable than ever! 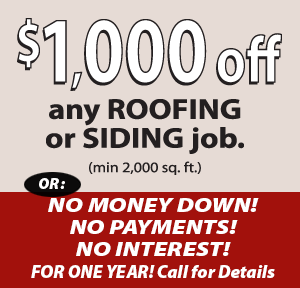 For a limited time only you can take $1,000 OFF a new roofing system or full-house siding project. * That’s huge savings on home improvements that will increase the comfort, value and energy efficiency of your home. We’re Making Financing Easier, Too! No payments for a full year! What’s keeping you from making your home more comfortable and attractive? Lock In Your $1,000 Savings Today! Call Homecraft®, Inc., today at 877-494-0377 to lock in your $1,000 savings on a new roof or siding. *Roofing or siding minimum of 2,000 square feet required.